This most classic of French veal dishes got its name from it’s light-colored creamy sauce. The sauce is more or less white (blanc), and the dish could translate as ‘little white veal stew.’ Ah oui, mes amis, but let’s not stop there. The veal in a blanquette is stewed until tender and then blanketed in its lovely sauce. Surprise, surprise — our English word ‘blanket’ derives from the Old French word blankete, itself a diminutive of blanc. And it doesn’t end there. When we say, ‘blanket with sauce,’ the French say napper, deriving from nappe, or tablecloth, a word with links to our ‘napkin’ (little cloth). 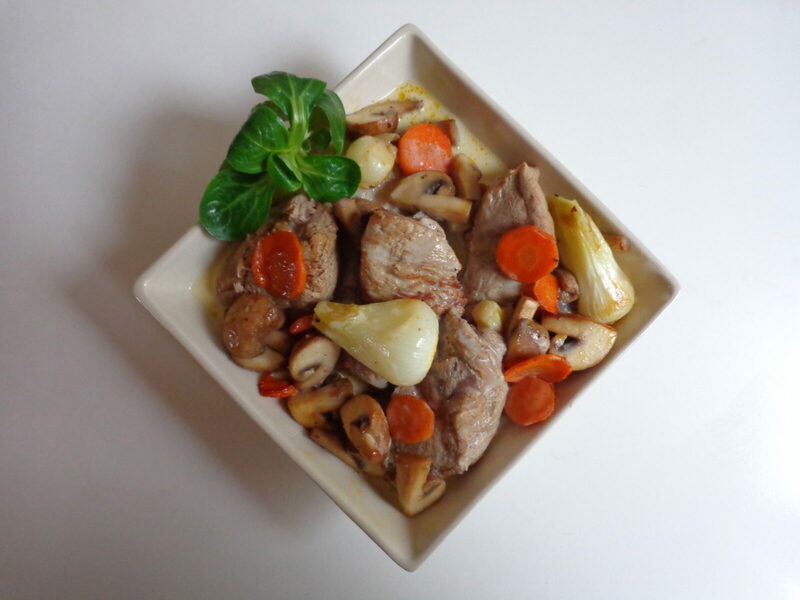 All these diminutives demonstrate the tenderness with which blanquette de veau is regarded by the French. An ultimate comfort food on a cool winter’s evening. But what about wine? Not just what to drink with the veal, but whether or not to stew it in wine? 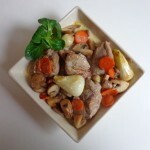 In classic recipes, the veal is stewed in water or stock without being browned first. This is to ensure it retains its light color. But the culinary arts have evolved, and many recipes — including this one, inspired by Paul Bocuse — call for browning the meat before adding the liquid: water, stock, white wine or a combination. I got into a conversation about this the other day with a senior expert at the French strategic planning commission who also loves to cook. I asked him about his strategy with blanquette. Did he stew the meat in wine? ‘Yes, always,’ he said, ‘because that’s how my grandmother did it.’ A fine strategy, if you ask me. P.S. On a totally different subject, for those of you in Paris, I will be reading from my memoir, Desperate to Be a Housewife, on Tuesday at the American University of Paris. It starts at 7 p.m. in the Grand Salon, 31 avenue Bosquet. I’d love it if you stopped by! This entry was posted in 7. Meat Dishes and tagged blanquette, cream sauce, recipe, veal. Bookmark the permalink.